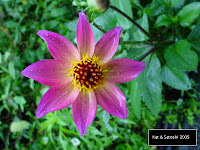 It is the end of the month, so let's clear out some photos. There was an assorted fish (maguro, ika, salmon), shrimp salad maki for lunch one day...mmm. We've been eating carrot and cucumber sticks with a teaspoon of olive tapenade with our dinners. My generous blog friend, Abigail of Mamatouille sent me some Jasmine tea and Espresso flavored Kit Kats, along with some Cadbury milk chocolate and a cup of 60% Ghiradelli chips...thank you again! The Jasmine tea flavored Kit Kat was my favorite, the tea flavor really shines through. The Espresso flavored was good also but a little on the bitter side. The Cadbury Dairy Milk was creamy. I received these Japanese sweets, which I think are called kangori from my friend Kazumi when we went to Nose. 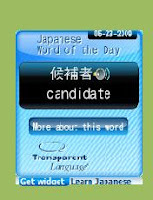 Kan is the chinese character for cold but also because they use kanten (agar-agar), gori is ice. These aren't cold treats but they resemble pieces of ice. Biting into them, they have slight crunch to them but the inside is gelatinous. For another lunch, I had some inarizushi stuffed with okowa (mochi rice). These were delicious because they have assorted savory flavored mochi rice. I made some walnut covered chicken for a dinner. I actually had made this before when I was in Hawaii, but used mac nuts then. These came out just as delicious. I tried Ellie Krieger's Ranch dressing, it was easy and delicious. We've also been eating carrot and cucumber sticks with this dressing too. This photo of the dog and his owner was taken in January (I think), I totally had forgotten about this photo. The owner can barely walk and uses this cart to steady herself while the dog just sits calmly as it rolls along. My goya (bittermelon) before I "killed" it. There were aphids on my bell pepper plants and I got crazy...sprayed everything with a soapy solution and the goya plant (and bell pepper plant) dried...I am hoping for a revival. Lastly, a bento I bought from Daiei for lunch...they had kodaimai (short wild rice), salmon, some assorted tempura and some nishime..only 498 yen (about US$4.98). The other day, I went to Yamaya, and they were out of Wychwood beers (insert pouty face). I asked the cashier and she thought I said "wedgewood" and says, "they make beer?" Then asked the manager but no one knew...sigh. So, yesterday, since my lesson cancelled last minute, I had free time on my hands. I went to Rokko to check out their Yamaya. Of course before getting there, I checked out several bread shops. Sometimes I think I could live on breads/pastries alone! especially when they are chewy, sometimes flaky, sometimes crispy, and paired with curry, sausage, cheese, chocolate...mmm. So, I googled and found two that looked interesting. Boulangerie Petit Blé is located near the Hankyu Rokko station. I didn't write anything down and tried to find it by memory...(I should have written down the directions)...I was going round and round longer than I should have been. As I was just about to give up, I found it! This bread shop was tiny, and had so many yummy things to choose from. I picked up this fig and walnut bread 210 yen (about US$2.10), it is only the size of two fists, but will be perfect for our breakfast. And I also picked up this chocolate croissant 180 yen (about US$1.80) for my 3 o'clock tea time. This was flaky, chocolatey goodness. There was another bake shop I was looking for, but realized it was really far away, (plus it was really sunny and hot) so I gave up and found Yamaya instead. The Yamaya in Rokko is HUGE! I think it is 2 times the size of the Minoo store. Unfortunately, they didn't have any Wychwood beers, but I did find some others (which I'll tell you about some other time). The pizza was thin and crisp and l-o-n-g about 30 centimeters (about 11 inches)! The curry naan had curry baked inside the naan...this wasn't too spicy but still both were delicious. It was a nice carbolicious Friday! Several weeks ago, we went to Sone and had a great time. Well, it is rose season and I realized that we haven't had time to visit our favorite park this year. 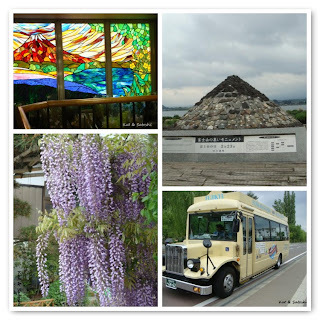 As I rode the train one day, I noticed a tiny park with colorful blooms, Teshima park, located near the Hankyu Sone station. So, on Tuesday, since it was semi-sunny, I went to check it out. Teshima Park had some roses here and there, but it seemed sparse and there were a lot of homeless guys drinking, which made it kind of creepy. Since I was in the area, I decided to also check out a bakery, Aix en Arles. This tiny bakery is located several streets from Vin Blanc and specializes in hard-type breads. I bought a pizza 160 yen (about US$1.60), pain au chocolat 160 yen (about US$1.60) and a rye bread 110 yen (about US$1.10). If you go to this bake shop and try this pizza, be careful not to break your teeth biting into this...boy, was it hard! but delicious...the sauce really tasted like a homemade ketchup, there was spicy sausage, maybe chorizo? and some cheese...simple but hard. The pain au chocolat was more bready than flaky, I think I prefer flaky over bready though. I sliced the rye bread, toasted it with pizza sauce, some leftover kefta meatballs and cheese and we had it for breakfast the next morning. This bread tasted more like sour dough and was chewy on the inside. Tuesday was a great chance to get out and about, the weather here has been really overcast, raining here and there, kind of iffy. I think the rainy season will start soon here...maybe it already has? Remember the nikumaki onigiri? Well, the other day I remade them, this time adding ginger and then baking them in the oven. By adding the ginger, it came out more Japanese tasting. I used some leftover kodaimai rice that I had in my rice warmer, formed them into cylinder rice balls and chilled them. Then I soaked the meat for 30 minutes. To the original sauce, I added about 1 tablespoon of grated ginger. After the 30 minutes were up, I heated my oven to 350F (180C) and wrapped each rice ball with the pork. Then I stuck them in for 15 minutes. After the 15 minutes were up, I drizzled the 1/2 tablespoon of honey, then put them back into the oven for another 15 minutes. After the second round of 15 minutes were up, I sprinkled sesame seeds and sliced one in half. Yummy! Since these tasted more Japanese-y, I recommend serving them with Japanese pickles instead of kim chee. Last Thursday, I met up with my friend Kazumi and she took me up to Nose (pronounced no-say). This area has a lot of farms, I think there is even a dairy. We stopped at a roadside market and picked up some veggies. Everything was so cheap! I picked up some daikon, 2 for 60 yen (about US$.60) with the tops. Whenever you buy daikon in the supermarkets they cut off the tops! so you almost never get to cook with them, which is sad because the tops have lots of nutrients in them. I also bought a package of spinach. There were about 8 small bunches in this package and only 105 yen (about US$1.05), a container of rakkyo (pickled scallions) for 600 yen (about US$6), this was the most expensive thing I bought but how can you go wrong with homemade? We heard that if we had come earlier there would have been a better selection, still, we were happy with our purchases. After buying our produce, we stopped into their restaurant for lunch. Their food is all homemade. We had their tofu hamburger set 840 yen (about US$8.40), this came with lots of different veggie dishes and the hamburger which had tofu mixed in. It also came with kodaimai (purple/reddish rice) which was also delicious. After our filling lunch, we went to check out a little cafe nearby called Yamaboshi. This cafe just opened in April and Kazumi knew the architect who built it. They have a light lunch menu and a dessert menu. We tried their dessert plate and we were so stuffed afterwards! The plate comes with a slice of chiffon cake, your choice of the dessert of the day and your choice of the gelatin dessert. All that with drink only 800 yen (about US$8), definitely worth the price (sorry no photo!). The coasters were cute too, made to look like those origami aloha shirts. On the top floor of the cafe is a little quilting school. It was a great little cafe. With the veggies I bought from the roadside market, I made takuan with the daikon. The recipe I used needed to be doctored, so I won't share it with you. Let's just say until I doctored it, it was super sour! With the tops of the daikon, I blanched them and chopped them up. With half of the tops, I added 1 can tuna (drained), 1 tablespoon yogurt (placed on cloth for 20 minutes to get out water), 1 teaspoon mayo. Mix well and top with sesame seeds. The spinach, I wilted and served with ponzu (citrus soy sauce). 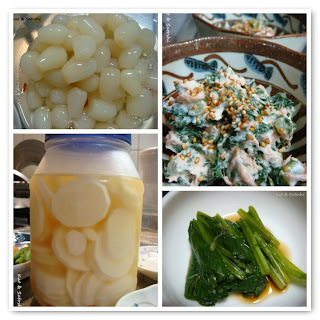 Here was our dinner on Sunday...kim chee with mushrooms, takuan, rakkyo, kodaimai, spinach with ponzu, green beans with lemon and dill & daikon leaves with tuna. These are the times I wish we had a car, so I can go veggie shopping here. Thanks for a great day Kazumi! p.s. with the other half of the daikon tops, a made a kind of furikake...heat 1 tablespoon of sesame oil, add 50 grams of chirimen jakko (dried young sardines), toss. Add the blanched and chopped daikon tops, toss. Then lastly add 1 teaspoon of sesame seeds. After everything is coated in the oil. Take off the heat and serve over rice. So last week, while Satoshi was at the DMV, I staggered my departure and arrived in Nagaokakyo so that by the time Satoshi finished his renewal, we could have lunch together. I occupied myself by walking to the Tenmangu, which is about 5 minutes from the Hankyu Nagaoka-Tenjin station. The large torii (stone gate) towers over the entrance. There are huge azalea bushes near the torii too, which are said to be over 150 years old! 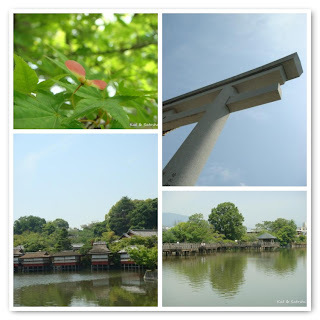 To the left is a large pond, with many tea houses, probably used for tea ceremony. To the right is a long wooden path to a hexagonal hut. The property is very large and along the edge of the ponds are lots of sakura (cherry trees), it must be very beautiful in Spring. 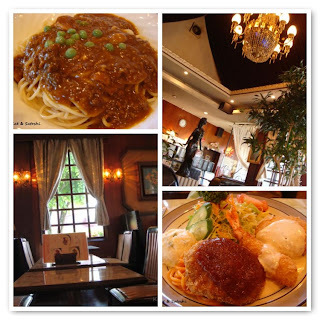 Satoshi had the Fleur lunch, this came with a lot of fried items---croquette, fried shrimp and cream croquette. I had the meat sauce spaghetti, this actually tasted REALLY different from the meat sauce I know, I think they had put either demi-glace or okonomiyaki sauce into this (or both! )...It was my first time to try this coffee shop and I am glad I did. The matcha (green tea) anpan was filled with white bean paste mixed with green tea. The yomogi anpan was filled with adzuki bean paste and the outer dough had yomogi (mugwort) mixed into it. Both were delicious especially after being toasted. I know I just posted about donuts from MisDo, but I had to share this one with you....This is called the "rich donut" (136 yen about US$1.36). You don't have to be rich to eat this, but the filling was quite rich. This version was filled with LOTS of dark chocolate pudding! If I am not mistaken there is a version filled with custard and one with whipped cream. On a side note, I was reading something on the web and the founder Mister Donut was the BIL of the guy who founded Dunkin' Donuts. You may or may not have noticed this little widget in the side bar of this blog. If you want to learn a new language (but maybe not ready to pay for lessons), this is a great way. They have many other languages, so check them out! MisDo (Mister Donut) along with MOS Burger (my favorite place to eat burgers in Japan) recently came out with these cute little donut "burgers" 168 yen (about US$1.68) for two and "fries" 126 yen (about US$1.26). The buns are donuts, the patty a square of chocolate filled with crisps, one burger has strawberry whipped cream and strawberry sauce, while the other burger has matcha (green tea) whipped cream and matcha sauce. The "fries" are actually donuts, I think they have mixed in potatoes to give it that french fry taste and it even comes with a packet of ketchup! sweet and salty, great combo! The "burgers" are delicious, though the sauces are hard to pick out. Japan is definitely fond of "little tastes". Wednesday, we went to renew Satoshi's Japan drivers license so I wanted to share with you an email I sent to my family and friends in 2001 regarding my experience with Satoshi at the D.M.V. "Yesterday, we went to renew Satoshi's drivers license. It operates from 8:30am to 10:30am and 13:30pm to 15:30pm. So we left home at about 7:00am, the bus to the station was PACKED! When we got to the destination by train, we had to catch a bus to the license office (this took about 20 minutes to get there). Line 1: Check to make sure that you are allowed to renew (only 1 month prior to expiration). Line 2: Pay for license (about US$23 for 3 years). Line 3: Make any address changes, etc. Line 7: Go to listen to a 30 minute lecture about safe driving. After you listen to the lecture, you receive your new license. Amazingly, we were out of there in about 1 hour!" UPDATE: A 3 year license with no accidents or violations, allows you to get a 5 year license, this costs 2800 yen (about US$28). The time that you can check-in is now shortened to 8:30-9:30am and 13:30-14:30pm. The rest of the drill is the same, including the lecture. Satoshi says that if you've had accidents or violations you need to listen to a l-o-n-g-e-r lecture (that should keep you violation/accident free). It is Friday, hope you have a great weekend! Over the weekend, the swine flu hit Osaka. They call it shingata influenza or new type of influenza, they have left the word swine out to deter people from avoiding pork! Everyone is wearing masks. Satoshi's office included. I had French on Tuesday, I wasn't wearing a mask and felt the eyes of everyone on me as I rode the train. You could actually tell that the amount of people walking around Umeda was less. I haven't been wearing a mask because I don't believe it can prevent you from catching the virus. Good hygiene can...washing your hands, gargling. There is a run on these masks most drugstores have sold out. And the makers are busily working overtime to try to fill the demand. I have also heard that someone is scalping them on the internet for 10 times the price that they should be. Luckily, we had some so Satoshi could bring some to his office. The part that has me shaking my head is most of the schools in Osaka are closed for a week, to try to contain the virus. The kids and their parents are supposed to be at home during this time, but what do I see on my way to class? Parents toting their kids to the department store, wearing their masks (of course!)...sigh. Hope this influenza gets contained soon! In yesterday's post, I mentioned that we had some delicious bread with our dinner. 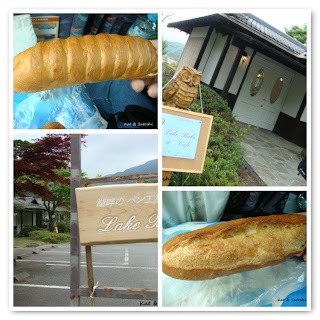 The bread was baked here at a tiny shop and cafe called Lake Bake. The owner of the B&B told us about the shop as we were checking-out. This shop is right near the shore of Lake Kawaguchi and the cafe has a great view of the lake and Mt Fuji (on a clear day). Having just eaten a big breakfast, we instead bought some "emergency" food. A milk bread filled with butter and honey 186 yen (about US$1.86) and a baguette coated with honey 230 yen (about US$2.30). We ate these on our bus ride back to Tokyo (this was actually lunch for us). The milk bread was soft and the sweet butter filling was delicious. The baguette despite being coated with honey was crisp, delicious with a touch of sweetness. A couple of doors down from the bakery was the Nature Center. This center has blueberry jam making classes as well as a lavender festival. We bought some jams (apricot, blueberry & rhubarb)600 yen (about US$6). The rhubarb jam caught my eye because I've seen rhubarb used in desserts and at restaurants but never in the markets here. We also bought kodaimai (literally ancient rice), this rice is like a short grain wild rice 1000 yen for 650 grams (about US$10). There are red grains, black/purple grains. When you add a tablespoon of it to a cup of white rice, it will turn the rice red or black/purple when cooked. There has been talk over the years that this type of rice has more minerals in it, though I don't know if this is true. I like it because the rice seems to get a bit more chewy and tastes a little nutty. We also found a mochi covered truffle from Kin-Daruma. Chocolate ganache is covered with a soft mochi (rice cake) then dusted with some cocoa powder. 900 yen (about US$9) for 9 in a box. Delicious! Eaten right out of the refrig was the best! Soft mochi and the semi-hard ganache...mmm. Though most of the sights like museums and such around Lake Kawaguchi can be seen in a day or so, we felt that to be able to see Mt Fuji from the various points around the lake was the true attraction. Our last stop before going to Haneda was stopping to have some gelato. 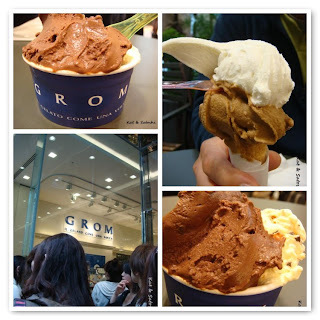 I had heard about Grom from Kathy & David's blogs. This Italian gelato shop recently opened in Tokyo on April 24th and is the only shop in Japan, so you can imagine the lines! Apparently during the Golden Week the wait was 2 hours, luckily we got our gelato after a 20 minute wait. There were so many flavors it was hard to decide. Unfortunately by the time we got there, Pistachio (which was one I wanted to try) was already sold out. Satoshi chose the piccolo (small) cone with Yogurt & Coffee, 490 yen (about US$4.90), these were a bit grainy but the flavor was delicious. The yogurt was a little tart and the coffee (made with Guatemalan coffee) had lots of flavor. I chose the piccola (small) cup with Crema di Grom (meliga biscuits, egg cream and Ecuador chocolate chips) & Extra Noir Chocolate (Bolivian chocolate gelato with chocolate chips), apparently no cream or milk is used to make this extra chocolaty gelato so it was very rich! this is for chocoholics only! The crema di grom was delicious, I liked the crisp biscuits here and there and the dark chocolate chips were delicious too. My cup was also 490 yen (about US$4.90). We enjoyed the gelato, though we wished we could have eaten it slowly to savor it, but the line outside waiting to come in made it hard to relax. On a side note, have you ever seen the eye of Shinjuku? I hadn't so Satoshi took me to the basement of the Subaru building, located in Nishi-Shinjuku. There is a sculpture of a mezmerizing eye. Made by Yoshiko Miyashita in 1969, the center of this "eye" spins. Kind of neat to watch everyone walk by without really taking notice of it, I guess they see it everyday...I actually found video of this on you tube (check it out)! Hope you enjoyed our little trip! We surely had a good time (despite the weather). 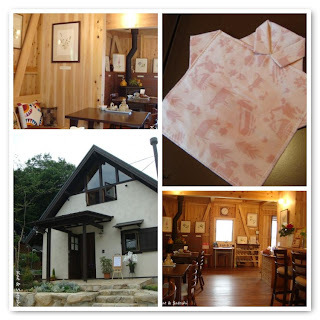 From the Kawaguchi-ko station, Gasthof Melange, a bed and breakfast is about 10 minutes away. 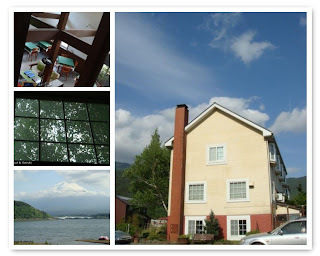 While most hotels and pensions (bed & breakfasts) in the area try to entice their customers with views of Mt Fuji and the lake, this pension is located off the main roads, in a quiet neighborhood near the Orgel (music box) museum. There is a 2-day pass you can buy at the Kawaguchi-ko station for 1000 yen (about US$10) per person for the Fujikyu Retro bus. This entitles you to get on and off two lines around Lake Kawaguchi. It is great transportation. A word of caution though, don't take a taxi in this area, most are on-call, not roaming around like in the big cities and for some reason, their meters are "faster", you will rack up a major bill just for a short distance. Gasthof Melange has 7 guest rooms. Their name comes from the German word "gasthof" which means hotel, inn. Melange is the English word taken from French for mixture. This place is halfway between a hotel and inn---in other words, bed and breakfast (B&B) or as the Japanese like to call them, "pension". The good thing about staying at these B&B are that the meals are homemade and the feeling is homey. Usually these places cost less than staying at a hotel. The bad thing is that the time that meals are served are pre-determined, and they usually have a curfew (when they will lock the front door). If you don't mind a few rules, then you'll enjoy staying at a Japanese B&B. This B&B is run by a couple who have two dogs, a corgi (Merry) and mini-dachshund (Marron). Since we stayed at this B&B a week after Golden Week, we actually were the only guests. This was nice, the owner spent a lot of time chatting with us about the area as well as other topics. About 4 years ago, he started taking photos of Mt Fuji from different areas around Lake Kawaguchi and has them displayed here and there around the B&B. Dinner was elaborate...Appetizers of roasted tomatoes, mussels & duck. The warm tomatoes were delicious. The mussles and duck were tender and simply prepared. Penne Arrabiata was cooked al dente with just the right amount of spiciness. Seared Salmon with a salad had a butter, sesame sauce. There were bones in the salmon so it was a bit hard to eat. There was also some french bread from a local bakery (which I'll tell you about in the next post) with some olive oil and salt. The bread was delicious, soft on the inside and crisp on the outside. Steak with roasted potatoes and some cheese. The steak was medium-rare with a some gristle, the sauce that was served with it was delicious, kind of like a berry-wine sauce. The potatoes were roasted tender and the cheese tasted like gouda. Dessert was an Earl Grey pannacotta, raspberry mousse cake and wasei mikan(tangerine). I was disappointed with the pannacotta as there was no earl grey flavor. The raspberry mousse cake was delicious, a light yellow sponge cake topped with a mousse with just the right amount of tartness from the raspberries. The tangerine was really sweet with no seeds. Dinner ran a couple of hours and after a very filling dinner, we chatted with the owner for about an hour then got to meet their dog, Marron, who was quite shy. The owner was happy that we didn't mind Marron coming into the dining room and was also happy to be able to chat about photography with Satoshi. Then Satoshi and I went to the bathing area and relaxed in the l-o-n-g ceramic tiled tub. Since most Japan homes (like ours) have tubs that are just big enough to sit in, it was nice to be able to stretch out in this one. The next morning, we woke early to see if Mt Fuji was willing to show us her face, but the clouds were too thick and we weren't lucky enough to see Mt Fuji. So, we went back to sleep until it was time for breakfast. Breakfast was bigger than what we were used to--sausage, mashed potatoes, a salad, scrambled egg, rolls, a little cup of mushroom soup and yogurt with some blueberry jam on it. As we left, the owner, his wife and their two dogs came to see us off. Marron had warmed up to me and wanted to play catch. 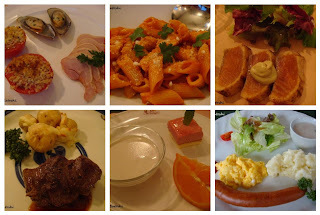 We had a great time and loved the homey feeling that Gasthof Melange had to offer. I saw a photo of this event on the internet last year and told Satoshi about it. The festival was supposed to run from April 29th until May 31st, but started early due to the warm weather in April. So, they opened the park on April 25th, but with the weird warm/cold days, the flowers have begun to die, so I am not so sure that they will last until the end of the month. Near Lake Motosu, in Yamanashi prefecture, there is a little park run by the people who run the amusement park (Fujikyu Highland) in the area. From this park you can see Mt Fuji (on a clear day). 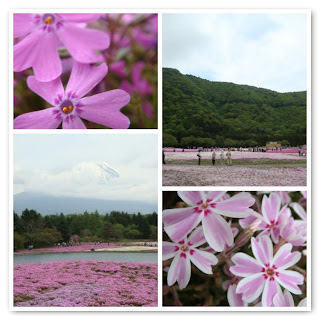 To decorate the park, they have shibazakura (literally ground cherry or lawn cherry, actually a type of phlox) as ground cover. The photo on their Japanese website is beautiful. The weather on Friday was overcast and very windy. The temperature was 14C (57.2F) but felt colder with the wind. By the time we got to the park, Mt Fuji had covered most of itself up with the clouds. We had a late lunch with some "fast foods" from the booths there. We shared the Motosu shika (deer) curry (there wasn't much deer/meat in it or much curry), Satoshi was bummed as it cost 800 yen (about US$8). The Fujimiya yakisoba, this was a drier type of fried noodle made with a thicker noodle. At 600 yen (about US$6) we felt this was a good deal because there was quantity. Still feeling hungry, we also got a bowl of houtou (pronounced hoe-toe), this is a miso soup based broth with flat noodles in it. This also had a lot of veggies in it. For 650 yen (about US$6.50) Satoshi liked this, plus it was a good way to warm up. We also tried the butaman, this was made with Fujizakura pork, it also had water chestnuts & takenoko (bamboo shoots). Satoshi thought this was a rip-off for 350 yen (about US$3.50), but it was larger than the ones they sell at convenience stores and this one was tasty. 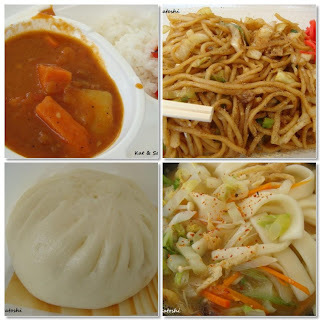 Though most of these foods were expensive, it was a great way to try the foods famous for this area. How we got there: we took the highway bus from Shinjuku (in Tokyo) to Kawaguchi-ko (Lake Kawaguchi) 1700 yen (about US$17) per person/one way. From Kawaguchi-ko station, we took the special shuttle bus to the park, 1800 yen (about US$18) per person, this was a round-trip ticket plus entrance to the park. Entrance to the park if you do not take this bus, it is 500 yen (about US$5) per person. I heard if you drive your car/rental car, it costs 500 yen (about US$5) just to park there. The special shuttle bus runs about every 30 minutes but depends on traffic, on weekends it apparently was running once every 2 or 3 hours. Though we didn't get to see Mt Fuji with a clear blue sky, we were happy that we got to see part of it. We're back from our little trip, but I need to go through photos and think up what to write, so in the meantime, here is a post I had in my drafts which I had written up about our dinner this past Thursday. Have you ever been influenced by a photo? The other day I was looking through the television guide and was oohing drooling over this photo. Since we don't subscribe to a newspaper, I usually buy a television guide from the bookstore. This television guide comes out about every 2 weeks and is like a magazine filled with info on movies, CDs, DVDs, Japanese books, the latest food trends, events and some fashion, as well as the television schedule. So, as I was flipping through the latest issue, I noticed this photo of nikumaki onigiri. The one on the far left actually has cheese on it. The caption on the photo says "nikumaku onigiri 300 yen (about US$3). Japanese pork soaked in a special sauce for 6 hours is wrapped around rice then baked in the oven to perfection"...doesn't it make your mouth just water?? I then googled around to find a recipe, but everything I found didn't sound "right", mainly because most used beef. Some used a pre-made bottled sauce. Then I came across a company that sold this online. Apparently this type of onigiri is a popular food item in Miyazaki prefecture. Miyazaki is located on Kyushu, the third largest and southern-most of the four major islands of Japan. While they didn't give a recipe (because they are selling their product online), they did give a list of the ingredients which they use for their product. They listed berkshire pork, rice, shoyu, sugar, apple, ginger and garlic. As soon as I saw "apple", I immediately thought of...bulgogi! So, I bought some thinly sliced pork belly and some kim chee. With the warm rice, make cyclindrical onigiri then chill for a couple of hours. Wrap each onigiri with pork, covering the rice as much as possible. Marinate for 30 minutes, turning them around at 15 minutes. Heat pan and cook well. NOTES: I know the caption said that the meat was soaked, but wasn't sure if I that was how I should do my version. Each onigiri took about 2 or 3 slices of pork, if you can find wider sliced pork belly you could probably cover your onigiri with 1 slice. Try to cook at a low heat to cook all the way through. I ended up microwaving since mine weren't cooked through. I am thinking the next time, I will soak the meat first then try baking it. This was delicious! It would probably be nice as a pupu (appetizer) or even in a bento. I served it as our main dish with some kim chee and cucumber sticks.